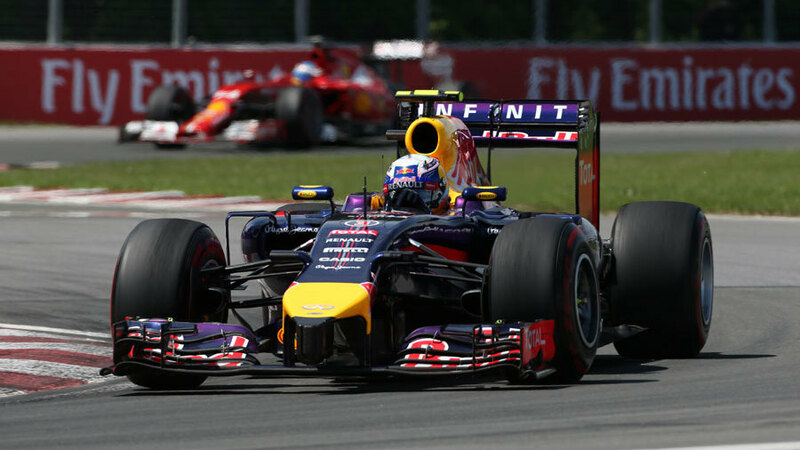 Daniel Ricciardo claimed his first career victory in an absolutely thrilling finish to the Canadian Grand Prix as energy recovery problems for the Mercedes pair blew the race wide open. Shock: The problems encountered by Mercedes blew the race wide open and set up a truly gripping finale and also allowed Nico Rosberg gain a huge lead over Lewis Hamilton in the title race. Shocker: Max Chilton was all over the place on lap one and ended up pitching Jules Bianchi into the barriers at Turn 4, bringing out the safety car. Best overtake: Daniel Ricciardo's move on Perez showed patience, having seen the Force India's gearbox for the best part of 20 laps, and set him up for a maiden career victory. Best lap: Ricciardo's laps before and after his second pit stop were ultimately decisive, getting him out ahead of Vettel and moving him into prime position for the race's incredible finish. Worst lap: Lap 47 and 48 were disastrous for Hamilton in the context of his season as the power disappeared from his Mercedes, forcing him to retire from the race. Drive of the day: Though Rosberg nursed his car exceptionally this has to be Ricciardo - who jumped Vettel at the pit stops, as it turned out crucially, and turned in a wonderful passing move on Perez at the death to set up a victory. It had looked like it would be a routine battle between Nico Rosberg and Lewis Hamilton before engine problems at mid-distance gave the chasing pack a sniff of victory. Hamilton was forced to retire with limited hybrid power and brake issues, while Rosberg limped around the circuit to eventually finish second. For a while it looked like the struggling Sergio Perez would save Rosberg's victory, but a stunning move from Ricciardo around the outside of Turn 1 two laps from the finish gave him clear air and let him reel in the leader for a pass later that lap. The drama was not finished there, however, as Felipe Massa got out of shape at the start of the final lap and crashed into Perez, denying the Force India fourth place after a gritty drive in front of the Red Bulls. At the end of the previous lap, Sebastian Vettel moved up to third ahead of Perez and was lucky not to be taken out by the two crashing cars at Turn 1 as they went either side of him. By keeping second, Rosberg stretched his lead over Hamilton in the drivers' championship to 22 points while Ricciardo moved above Alonso into third. At the start Hamilton had taken the fight to Rosberg and went into Turn 1 neck-and-neck with his team-mate, but the German forced him out and across the grass, gifting second to Vettel. Everyone got through the first corner unscathed but that did not last long, with Max Chilton getting out of shape coming through Turn 4 and pitching team-mate Jules Bianchi into the barriers, bringing out the safety car. Chilton was also forced to retire for the first time in his F1 career, ending a run of 25 completed grands prix, while Pastor Maldonado took evasive action across the grass to avoid getting caught up in the melee. The safety car stayed out for seven laps and Rosberg managed the restart perfectly, keeping his lead without trouble while Hamilton appeared to be caught out and spent the next few laps chasing Vettel. When the DRS was enabled on lap 10 it became easy for Hamilton, powering past Vettel on the back straight and then setting about reeling in his team-mate out in front. Ricciardo pitted from sixth on lap 14, hoping to undercut the Williams pair ahead of him and sparking a flurry of activity in the pit lane. Williams successfully got Valtteri Bottas out in front of Ricciardo but Massa was not so lucky, coming out behind Daniil Kvyat, who had not pitted, and Fernando Alonso, who had. Rosberg pitted on the 19th lap and very nearly lost his car in the wall on the exit of Turn 4 on his outlap. The error did not cost him first place as Hamilton's pit stop a lap later was longer, allowing Rosberg to maintain a 2.5s lead. But Hamilton quickly started to close in again, getting into DRS range and forcing Rosberg to run across the final chicane on lap 26. The mistake was investigated by the stewards, but the lead Mercedes was only issued with a warning rather than a penalty. Behind the leaders, the one-stopping Force Indias of Sergio Perez - on super-softs -and Nico Hulkenberg - on softs- were third and fourth, crucially ahead of Vettel, who failed in his attempt to pass Hulkenberg on lap 24 at the hairpin. Perez eventually pitted for softs on lap 35, coming out behind Alonso in tenth but on a superior strategy to many of the cars in front. Hamilton's chase soon faltered as both Mercedes started losing power and were soon lapping slower than anyone else on track. When Vettel did eventually pit he came out behind Perez, and then lost track position to team-mate Ricciardo after his pit stop on lap 37 in what was quickly becoming the battle for a potential race victory. After his second pit stop Hamilton came out ahead of Rosberg, but his car gave a puff of smoke from its rear brakes and he limped back to the garage to retire, giving Rosberg reason to turn his focus on nursing the car home for victory. But behind him Perez was leading the Red Bulls and Massa, and it seemed impossible Rosberg would have enough to keep them all at bay. Perez was backing Ricciardo and Vettel up and suddenly gave Rosberg a bit of breathing space in front. After pitting from a briefly-held lead, Massa finally got free of Bottas and up to fifth on lap 49, immediately setting a fastest lap as he chased down the cars at the front. But as he closed on the Red Bulls he struggled to find a way through despite having the DRS and his hopes of victory faded. Out in front, Ricciardo seized his opportunity and finally got past Perez with a great move round the outside of Turn 1 five laps from the end. It was then a matter of time before he passed Rosberg, sealing the deal at the final chicane after the Mercedes' lack of electric power was laid bare on the back straight. 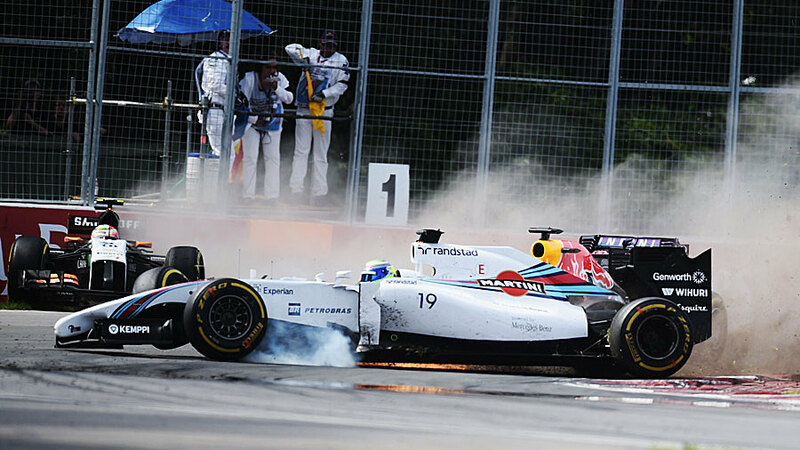 Then came Massa's shunt with Perez. The Williams driver was attempting a move into the first corner when he appeared to be caught by surprise as Perez, on older tyres and with a brake issue, decelerated earlier than he expected. Massa's car mounted the Force India and sent them both deep into the barriers beyond Turn 1. The pair were sent to the medical centre for precautionary checks, but initial reports suggest both are fine. The incident brought out the safety car, meaning Ricciardo could coast across the line for the first victory of his career. The incident also promoted Jenson Button to fourth after a scintillating final stint in which he passed Fernando Alonso and Nico Hulkenberg to score valuable points for McLaren.